Let Smoky Mountain Retreat provide comfort, relaxation, and a place of escape for you and yours on your Pigeon Forge vacation. 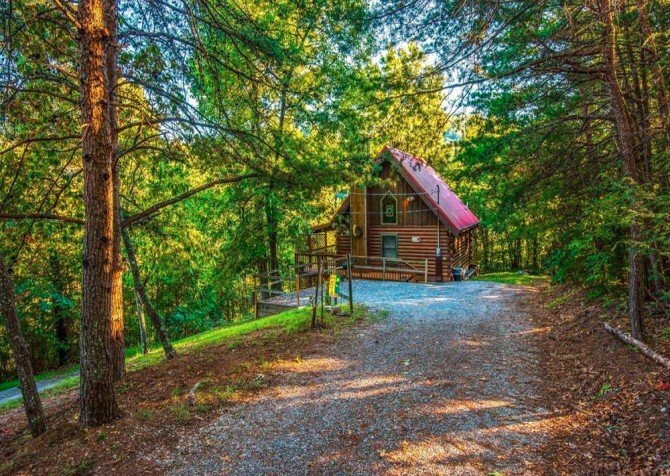 Perfect for a family of 6 or a group of friends, this cozy cabin in the Smokies features 1 bedroom, 2 bathrooms, a fully equipped kitchen, a loft area with a queen-size bed, and charming outdoor spaces. Jump on the couch for movie night on the big screen TV, bust out some board games on the dining room table, tell ghost stories by the fireplace, go for a dinner show in town, and unwind in the outdoor hot tub with your pals. 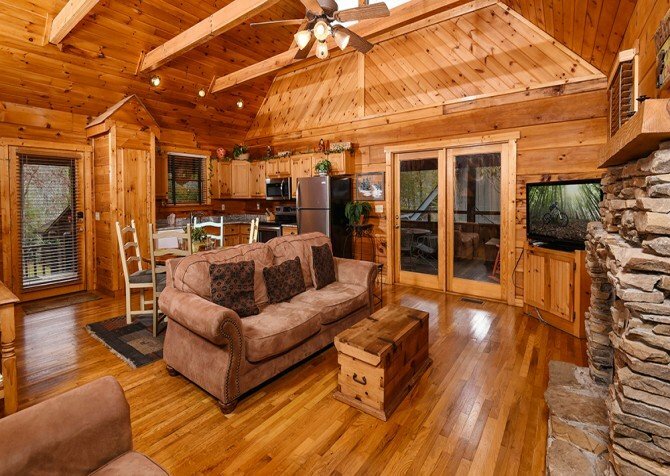 This comfortable cabin is also just a few miles from downtown Pigeon Forge, so you can easily spend the days exploring. Shop and eat at The Island, ride roller coasters at Dollywood, drive go karts and play mini golf, check out arcades, ride the trolley along the Parkway, or head to the Great Smoky Mountains National Park for hiking, biking, fishing, horseback riding, and picnicking! Walking through the front door, you’ll enter a cozy space with an open floorplan and bump straight into the living room. With a love seat, a sleeper sofa, and an arm chair, everyone can have a comfy seat for those evening chats with hot cocoa and mini marshmallows. Come home from a cool night in town and warm yourself by the gas fireplace — complete with a stone border to enhance the rustic cabin feel. Lay out some snacks on the wooden coffee table and flip on the big screen TV to entertain the kids while the grownups sneak off to the hot tub out back. As a bonus, behind the stairs lies a little nook of board games and puzzles for everyone to enjoy on family game night. Head over to the quaint, fully equipped kitchen behind the living area for tasty grub and refreshing drinks. For breakfast, toast up some blueberry bagels in the toaster, grab the cream cheese from the refrigerator, and brew your favorite Starbucks blend in the coffeemaker. For lunch, heat up last night’s fine-dining leftovers in the microwave or blend mixed berries with a banana in the blender for a healthy pre-hike treat. For dinner, easily open all the cans you need for your famous spicy veggie chili with the electric can opener and pop some rolls in the oven to complement the delectable meal. Leave your dishes in the stainless-steel double sink (with a sprayer) while you enjoy your planned activities in the city — the dishwasher will do all the hard work for you later. Conveniently serve all your meals on the wooden dining table for 4 in the dining area just off the kitchen. After the plates are cleared, bring out the freshly baked apple pie you’ve been hiding — serve it á la mode to send those smiles to the next level! Give your food a chance to settle while playing a board game or trying to solve a 1,000-piece Disney puzzle with the children. If the little ones aren’t really interested, sit them down on the large area rug in the living room with coloring books and crayons on the coffee table. 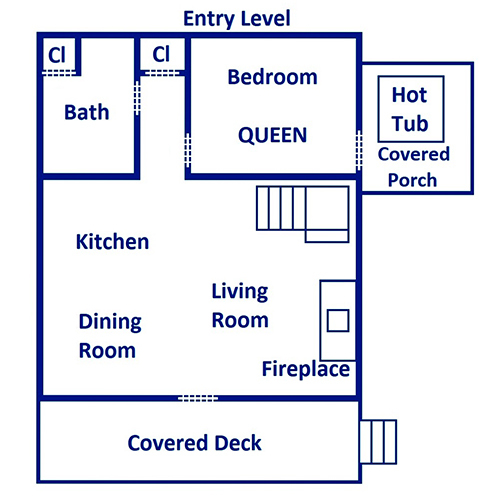 Down the hall from the kitchen is the bedroom, featuring a queen-size bed, a ceiling fan, a wall mirror, a mounted flatscreen TV, a DVD player, and — most importantly — direct access to the hot tub space! After taking a relaxing soak in the outdoor hot tub, slip on your PJs and put in a chick flick for a night of sighs and sways or watch a thriller for chills and screams. 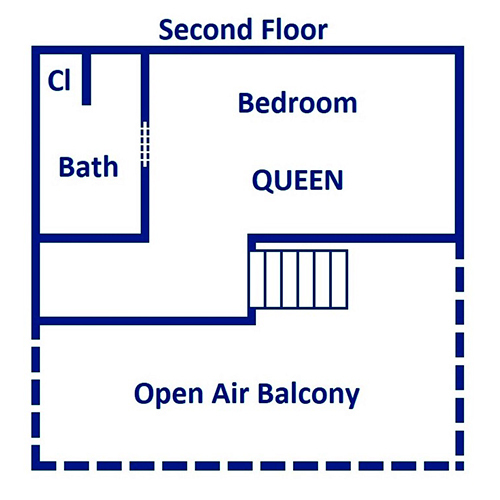 Heading upstairs, you’ll find a bedroom area in the loft, complete with a wooded view, a queen-size bed, a ceiling fan, a wall mirror, a mounted flatscreen TV, a Blu-ray player, and an en suite bath (with classic bear-themed décor). Put your spy skills to the test by peeking at your friends in the living room from the balcony, utilize the lamp on the nightstand to read bedtime stories to your babies, and enjoy the sight of nature every morning from the comfort of bed. With flat, paved parking and only 3 steps up to the front porch, unpacking the car will be a breeze. As a motorcycle-friendly cabin, the parking area also has room for a trailer. On the porch, you’ll find rocking chairs, great for chilling with your morning coffee. With a quaint lamp post in the front yard, sipping your evening tea in a rocking chair will be relaxing and serene. If you’re in the mood for an afternoon barbecue, a charcoal grill (picnic-style) awaits just off the walkway. Encourage the kids to play a board game in the living room while the adults get in some chat time outside with the grill master! Just through the bedroom on the entry level is the outdoor hot tub space with privacy walls — to let you sense nature without feeling too exposed. Eager for you to check your social media accounts, Google every question you can think of, and play online games all night is the free in-home Wi-Fi! When the excitement of your good vacation times keeps you up at night, let the internet keep you company. However, if everyone in the group can’t sleep from all the thrills of the day, throw a dance party with the provided CD player. Grooving to the beat is always better than counting sheep! After shaking your tail feathers all night, a relaxing time at the Pin Oak View Resort community pool is just what you’ll need. Send the kids in for a swim while you lie back on a lounge chair and catch some rays. Check out the local scene in downtown Pigeon Forge — less than 5 minutes away from Smoky Mountain Retreat. From gobbling down hearty Southern meals and viewing entertainment beyond belief to riding all the rides in town and seeing wildlife up close, Pigeon Forge has it all! Providing not only a delicious feast but also a fantastic show, the Biblical Times Dinner Theater is a great place for entertainment with your meal. Take the whole family to Dollywood, an amusement park filled with yummy food, amazing entertainment, fantastic rides, unique souvenirs, and fun seasonal events! An unforgettable experience awaits at Parrot Mountain and Gardens, an enchanting place with beautiful landscaping, parrot cottages, a secret garden, a baby bird nursery, and an awe-inspiring waterfall. 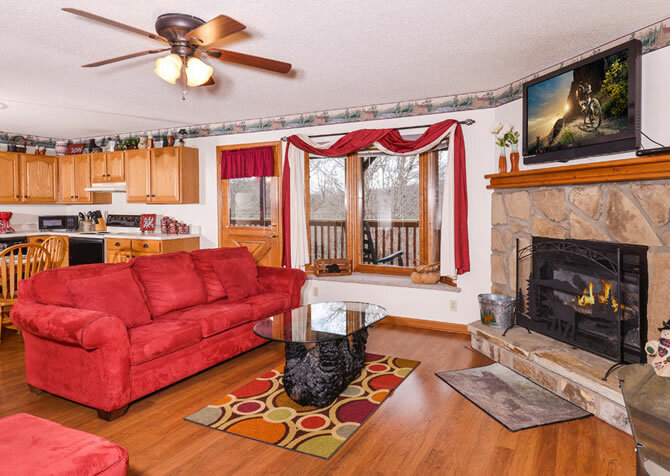 "Loved this cozy cabin — great location if looking for something close to the main road. Very quiet for being so close to all of the action in Pigeon Forge!" "Very nice and peaceful place! Great location right in the middle of all the attractions! Hope to visit again soon!" We couldn't agree more! Smoky Mountain Retreat is a great place to unwind after playing at local attractions in Pigeon Forge. We miss YOU already! Yes! 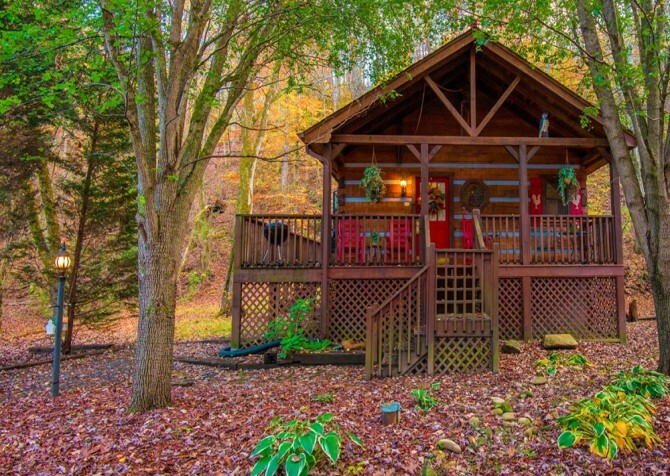 We are so glad to hear how much you loved your cozy cabin stay at Smoky Mountain Retreat! It's so nice to be able to enjoy the quiet of the Smokies while still being close to local attractions and downtown dining. When you're ready for another great Smoky Mountain vacay, let us know!